What is a Cache® or Recessed faucet aerator? How to remove a Recessed or Cache aerator? Special consideration for Moen and Delta faucet aerators. Cache® or otherwise known as recessed faucet aerators thread directly (and disappear) into the faucet spout, making it vandal proof by design. They are also called recessed faucet aerators or hidden faucet aerators. To remove a Recessed Cache Aerator, you will need a special key which you should have received with the faucet. 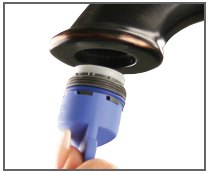 Many people loose the recessed aerator key and finding a replacement can be a challenge. We always to suggest to check with OEM first, but if you've lost the recessed aerator key, you may find this complete set of cache aerator removal keys helpful. There are four different sizes of Cache® aerators. 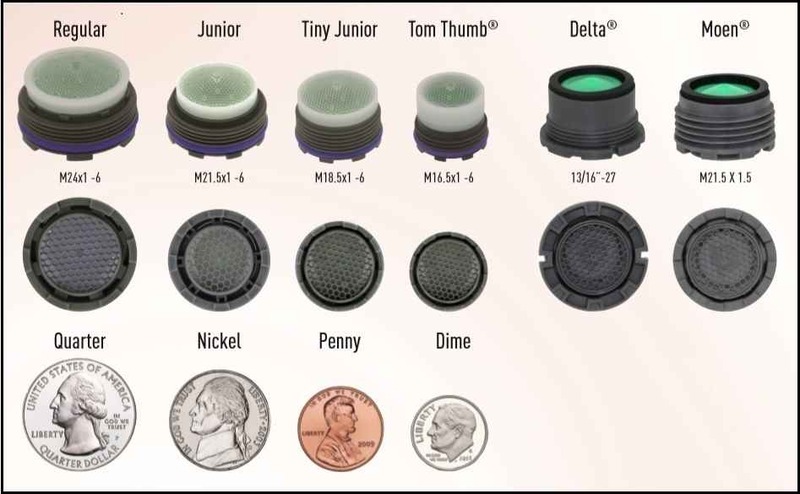 By using a quarter, nickel, penny and dime; you can easily identify the size of a cache aerator. All Cache® aerators are metric size. The Standard size, which is a M24 x 1, is the size of a quarter. Click to find Cache Std Size Aerators. The Junior size, which is a M21.5 x 1, is the size of a nickel. Click to find Cache Junior Size Aerators. The Tiny Junior or TJ size, which is a M18.5 x 1, is the size of a penny. Click to find Cache Tiny Junior Aerators. The Tom Thumb or TT size, which is a M16.5 x 1 is the size of a dime. Click to find Cache Tom Thumb Aerators.